A shattered window. 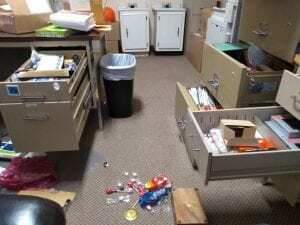 Papers, files and objects scattered haphazardly around the pastor’s office, and a large flat-screen television leaning against the wall just outside the office. A tribal police officer walking around inside the building. This is not what you would normally expect to see at a church just prior to the beginning of Sunday morning services, but it’s what worshippers saw as they arrived for the 9 a.m. service this past Sunday at the Eagle Butte United Church of Christ on Cedar Ave.
A break-in had occurred sometime during the night; a window in the fellowship hall had been broken for the perpetrator to gain entrance. While it was determined that nothing was actually stolen, the break-in was unnerving to worshippers, as it was the latest in a string of break-ins and burglaries that have occurred at the church over the past several years. The perpetrator of a 2017 break-in stole several valuable star quilts and was recently sentenced. Pastor Pauline Webb informed the church during the morning service that she had received a call at 7:00 p.m. on Saturday night advising her that a prowler had been seen around the church and that police officers from both the City of Eagle Butte and the Cheyenne River Sioux Tribal Police had responded. Tribal police provided extra patrols. Police advised Pastor Webb that they would be dusting the television and the office for fingerprints and would see if they could also obtain DNA. The Eagle Butte United Church of Christ is not alone among area churches in dealing with break-ins. The First Baptist Church on Main Street in Eagle Butte has also suffered several break-ins in recent years. The broken window was initially covered over with plastic and tape so as to keep the cold wind and snow out during the morning service. 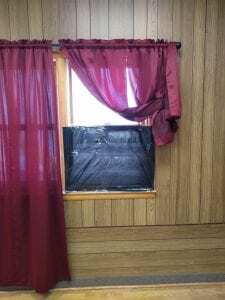 Several church members spent time Sunday afternoon repairing and boarding up the window.